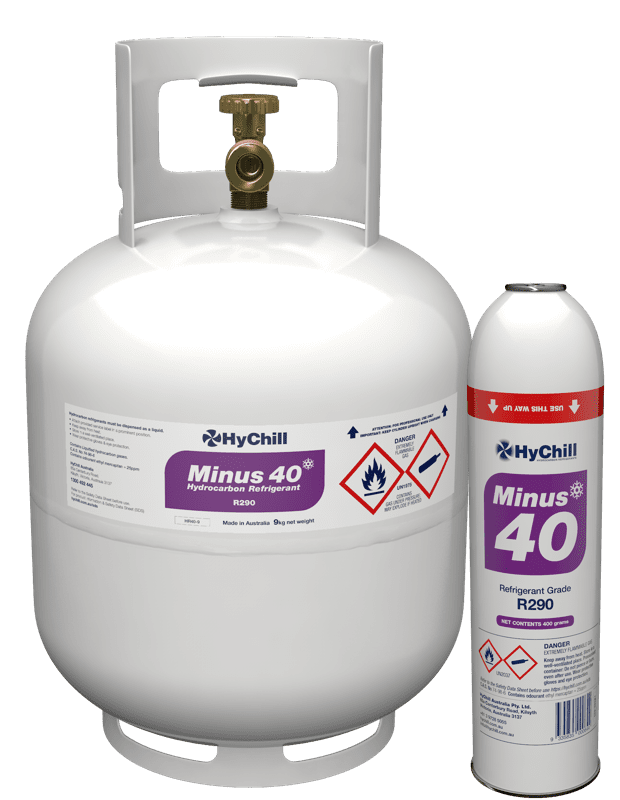 Minus 40 is a high-purity R290 [propane] single ingredient refrigerant used in medium to low temperature refrigeration systems. Ideal for domestic and commercial air conditioning and refrigeration. HyChill Minus 40 is the natural organic solution for air conditioning and medium temperature refrigeration. Its superior thermodynamic properties make it an ideal refrigerant for use in systems that aim at 6-star Energy Efficiency rating. where energy efficiency and consistent performance matter. rooms and hydrocarbon-designed split systems. Hydrocarbon refrigerants are flammable and must be handled in a safe and responsible manner by properly qualified, trained and/or experienced technicians and mechanics. Relevant regulations or standards should always be adhered to. Most commonly used refrigerants when mixed with oil vapour and air can be flammable. In plain terms, hydrocarbon refrigerant is safe for both refrigeration and air conditioning use. However, like petrol, solvents, and other commonly used volatile products, hydrocarbon refrigerant are highly flammable, and therefore should not be released in the presence of an ignition source. HyChill hydrocarbon refrigerants have a distinctive "rotting cabbage" odour added to to assist with leak detection. The odour can fade with time. Safety Data Sheets and other usage guides available at https://hychill.com.au/sds or mailed on request. Cylinders are fitted with a standard refrigeration liquid withdrawal valve.